Can be applied to damp surfaces that were newly cleaned or repaired. Do NOT wipe on or wipe to dry. Air dries in about 1 hour. For best results, first clean surface using our non-toxic Cleaner Prep or any non-bleach product. Use hand-pump sprayer with fine mist nozzle or fogger. One gallon covers 1,000 square feet or more. It’s non-toxic with no harmful fumes, so no need to buy expensive protective gear to apply. Other mold products rinse away the first time they get exposed to moisture. As a result, you need to frequently spend time and money to get rid of the mold that quickly re-grows. Endurance BioBarrier not only covers double the surface area of competitors, but its invisible microscopic protection lasts through hundreds of wet-dry cycles, saving you lots of time and money. “I was really surprised and shocked 3 months later when the place where the mold had been, actually appeared to continue getting even cleaner and whiter!” David C.
“After 3 months, all areas in our university’s locker rooms and saunas show no sign of mold, mildew or fungus. Are we ever glad you offered to let us be a test site!” Allen W.
“My client was thrilled because he was able to provide his tenants with peace of mind. I will be using EBB and recommending to all my clients as a pro-active measure.” Bart W.
Endurance BioBarrier’s water-based formula is safe to use on all indoor and outdoor surfaces. Has light cleaning product scent. It’s biodegradable, so safe for the environment, too. Active ingredients include proprietary blend of antimicrobial biocides and fungicides that are EPA/TSCA registered to destroy pathogens. Formulated to eliminate 99.9% of mold, mildew and germs within 48 hours. 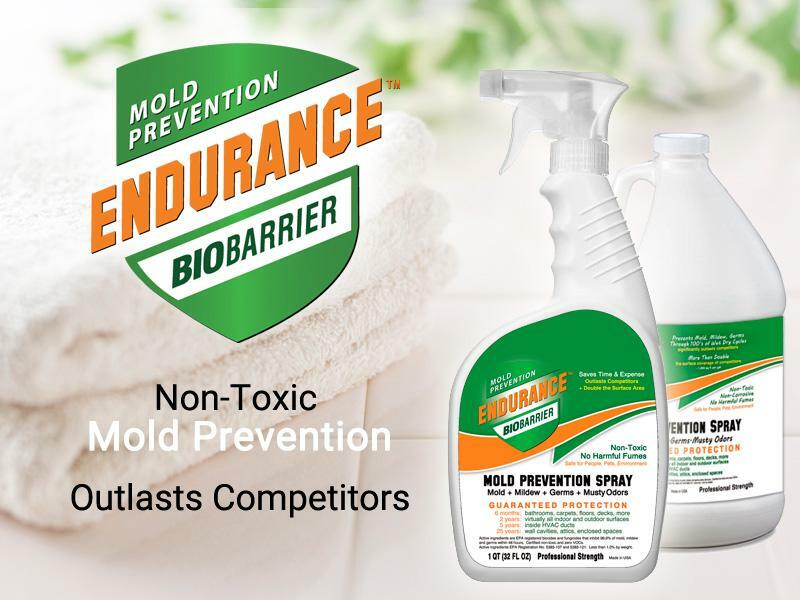 Endurance BioBarrier is the longest-lasting mold preventative you can get. But it also offers the longest-lasting protection against germs, too. So spray it anywhere and everywhere. Top 4 reasons why you should choose Endurance BioBarrier for long lasting protection against mold, mildew, germs, musty odors and dry rot. Our high-tech formula micro- scopically binds fungicides to any surface. This is why it can prevent mold and mildew through 100’s of wet-dry cycles. Since EBB is non-toxic, and is invisible because microscopic, it is safe to apply on all indoor and outdoor surfaces. Watch our application tips. 1 and 5 gallon sizes for large DIY projects. Plus a Contractor Grade version in all sizes for professionals. Watch tips for large applications.